So, I’m be bit belated today. Okay… very belated and, to be honest to entirely pleased with either paper doll dress. I wasn’t when I first drew them and I’m still not. I liked the masquerade costume more then the ballgown. I was terrified of drawing the train and I still don’t like how it came out. Oh well, it just means I’ll be doing another ballgown for Florence. It’s been quite a few months since I did the old one, I think I could do it better now. Trains are totally impossible for me. I need to keep practicing on them. 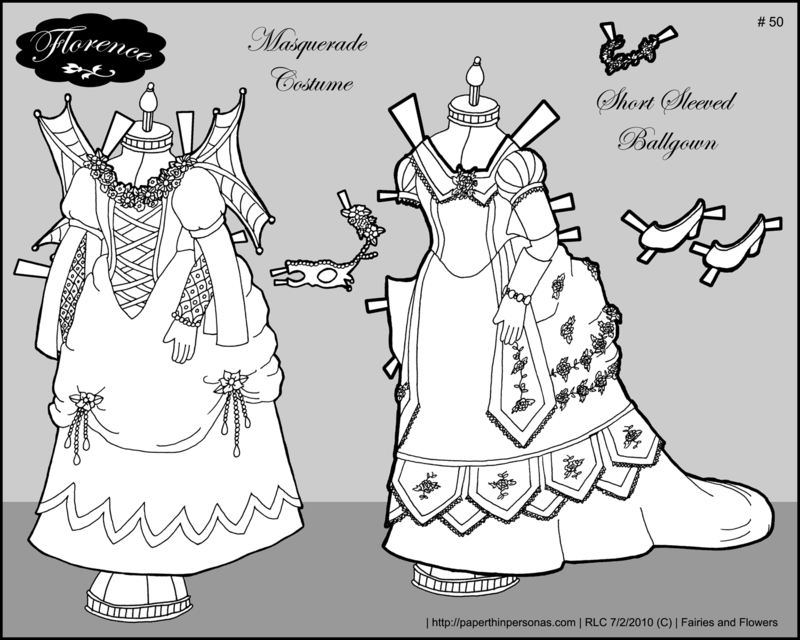 Oh, and here is Florence, the paper doll that can wear these outfits. Oh, these are sweet! I love all the detail, especially the creepy little wings and the sprays of beads on the overskirt. And I hear you on trains ^^;; Still haven’t figured them out. I think this might help; try putting your doll into a black and white background and use it to give your doll a floor to stand on, this might help with fabric wrinkles and pooling. Hope that gives you ideas and inspiration for future outfits.